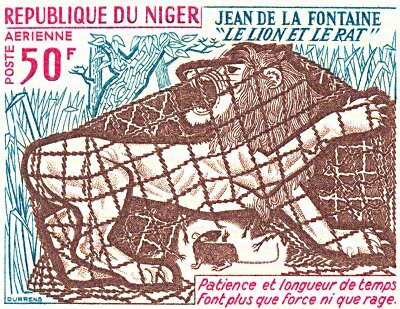 1972 Two imperforate stamp proofs for stamps to be issued by the Republic of Niger. Each is marked "Imprimerie des Timbres-Poste - France." 25F and 50F, respectively. In honor of Jean de La Fontaine. $10.75 from Collect+, The Hague, The Netherlands, through eBay, Oct., '02. The surprise for me in these two proof-sheets lies in the little note in the bottom corner: "Imprimerie des Timbres-Poste - France." 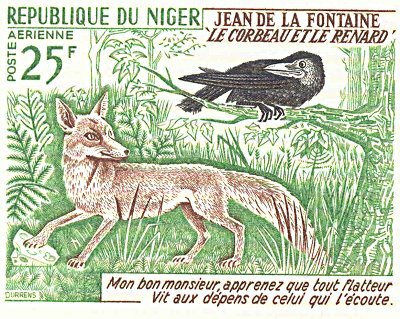 Does France print Niger's stamps? These two proofs are as good a printing of the stamps as I have seen. Both stamps seem to include three colors, black, brown, and green. A strong brown foreground seems to stand against a sketchier green background. Click on the stamp itself to see an enlarged version.